This book was previous published as THE ADAMAS BLUEPRINT.THE EXPERIMENT WAS A FAILURE. THE RESEARCH SOUNDLY DISMISSED. BUT SOMEONE IS HUNTING DOWN THE SECRET KNOWLEDGE A YOUNG CHEMIST HAS UNEARTHED . . . 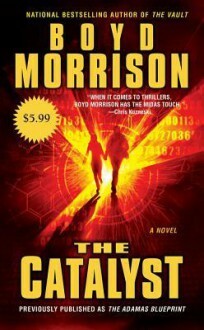 IN AN EXHILARATING THRILLER FROM THE AUTHOR OF THE ARK.Chemistry grad student Kevin Hamilton is sure his advisor Michael Ward's death in a suspicious fire was no accident.The young Ph.D. candidate received a cryptic message from Ward just before the fatal blaze--a warning that their recent collaboration on a supposedly failed experiment had actually brought about one of the most important discoveries of the century: Adamas, a chemical process worth billions, and one with the potential to topple entire industries. Now on the run with his girlfriend, Erica, the two must elude relentless assassins long enough to protect the top-secret information, thwart a global conspiracy, and save their own lives before time runs out.